Surrounded by primal forest this 2 bedroom, 2 bath, solidly constructed home has amazing Pacific Ocean and Ballena island views. Walk to one of the greatest swimming beaches around, kayak out to the islands, or just relax pool side and watch the sunset. This house is a turn key operation, all the furniture is included. The area around the home includes great landscaping, water management and a cemented driveway. 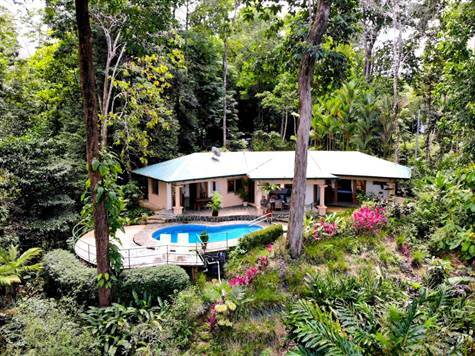 The house sits on a large jungle covered lot. This home really is set up perfectly for a future rental home. The Ballena area is rapidly growing and becoming the new hot spot of the southern zone Costa Rica. Conveniently located in the heart of the Costa Ballena. Area is full of natural attractions to include many waterfalls, hiking trails, numerous beaches to include Tortuga, Ventanas, Ballena and Uvita. Nearby beach and Bay of Pinuela is soon to receive a new tourist pier for easy access to the ocean playground. The land borders a year round river, and also has room to expand with more structures.